Envi is a game I created as a part of my Bachelors of Fine Art thesis. It was created to introduce population genetics concepts to middle school and/or high school students. Genetics and population genetics can be difficult for students to understand, in part, because they rely on so many variables. They are linked to many different concepts and subject areas. 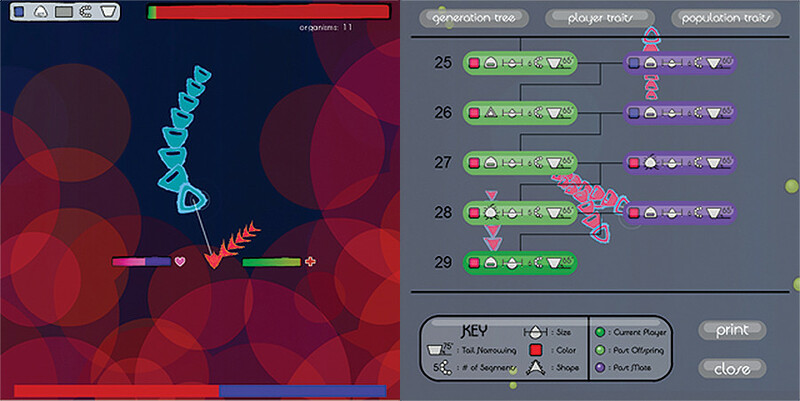 In short, evolutionary biology and population genetics can be difficult to teach, and my thought was that a game might help some students understand certain aspects of these subjects better. I also found that programming itself lends itself very well to genetics. Photos of the installation that went with Envi for my BFA thesis presentation. There are four photos. Upper left, someone playing the game at one of the desks I painted. Upper right, sign outside the room, peeking into the installation space. 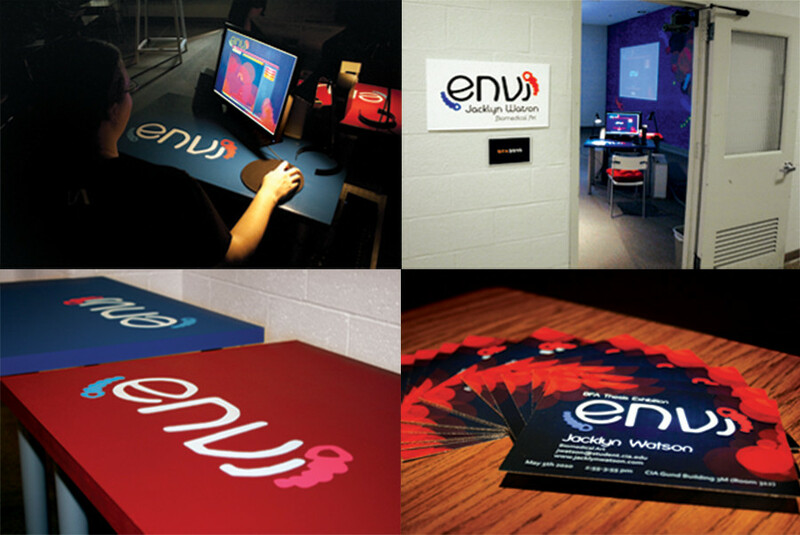 Bottom left, a photo of the desks with the Envi logo painted on them. Bottom right, small business cards with information about Envi and how to contact me. Screenshot of the game itself. Screenshots show the main game with the player interacting with the AI and the environment, and the graph generated as the player interacts with the AI. The graph shows a rudimentary genetic tree of sorts, that doubles as a history of the players interactions with other organisms during the game. Final designs for the different segments that make up the organisms/characters in the game. There are twenty-eight different segments a player can have. Above: several mock ups created in illustrator to test colors of the characters, items, and environments all together. Below: concept art of the different general shapes that the segments can be. Includes a rudimentary “genetic code,” a series of letters assigned to each segment so that I could start to figure out how a player would get assigned a specific segment shape.